I’ve been working on a secret project on and off again for over 2 years. It was originally going to be a rogue-like adventure game set in the Old West. After a lot of experimenting that didn’t pan out [Old West Humor], I gave up on it. Don’t panic though. I’ve actually got a rogue like fleshed out and in the process of asset creation and prototyping. I’m convinced the design is solid but it’s going to be next year before it’s in any shape to really talk about. So along with the SI mini expansion I’m busy. 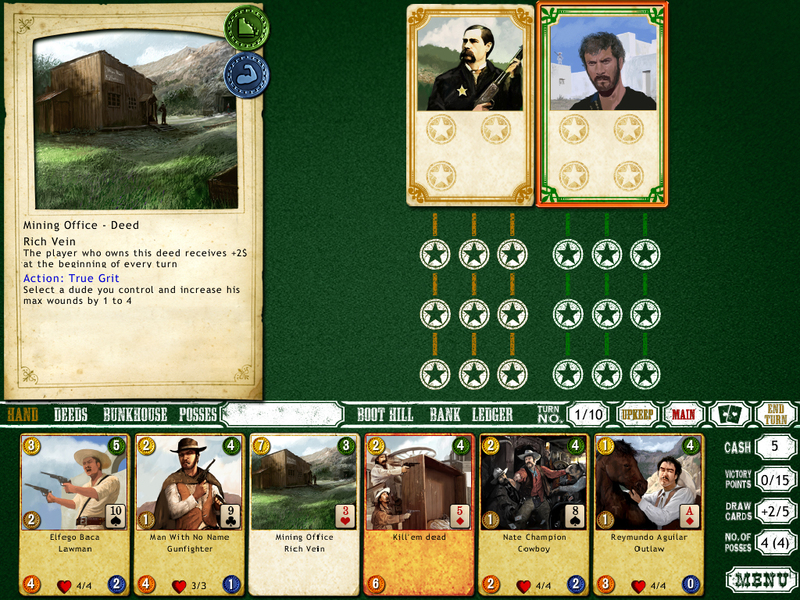 But the failure to get the core game conflict resolution mechanic working (a poker game where you manipulated cards) left me with a bunch of artwork for an old west game and so I came up with Six Gun Saga. It will remind you of some games like Race For the Galaxy, Dominion and of course Poker and it’s more than just a simple card game as it’s got a small board for moving your “posses” around and going after your opponent’s homesteads…and more importantly killing off their dudes which gives you victory points. It’s single player focused. You can play up to 3 other AI’s. You’ll meet a lot of historical characters from the Old West. This all sounds like a jumble but I’ll start posting more about the mechanics. If you have played any of my previous games you’ll find a lot that is familiar and hopefully that feeling that you can’t always quite do what you want and a bunch of hard choices. This entry was posted on Friday, September 10th, 2010 at 12:32 pm	and is filed under Six Gun Saga. You can follow any responses to this entry through the RSS 2.0 feed. Both comments and pings are currently closed.